You know that excited feeling you get when you walk down the Christmas aisle and it’s Just. So. Sparkly. 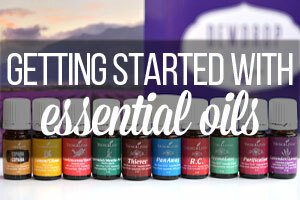 You just want to buy everything? (It can’t just be me who feels that way?) 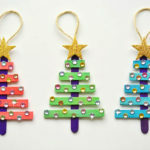 When I was in university, my sister and I shared a townhouse and the first Christmas we spent there together, we went to the hardware store and bought a Christmas tree, tinsel and tons of ornaments to put on it. And I mean TONS of ornaments (and lights for that matter…). It was the first time we were let loose down that sparkly Christmas aisle, and we fell in love with everything we saw. There wasn’t an empty branch on the whole tree by the time we were done! We were so proud of our tree that we called up my parents, and even our grandparents, and invited them over for dinner that night, just so they could admire our very first Christmas tree. It was a lot of money for us since we were both still students, but it made us SO HAPPY. It’s 15 years later and that’s still the tree that my husband and I put up, along with half of the ornaments (and of course a few new ones). My sister and I split the ornaments in half and there’s still more than enough for each of us to decorate our own trees! 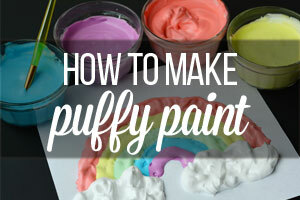 Start by lining an 8″ x 8″ square baking pan with aluminum foil and then spray it with cooking spray. 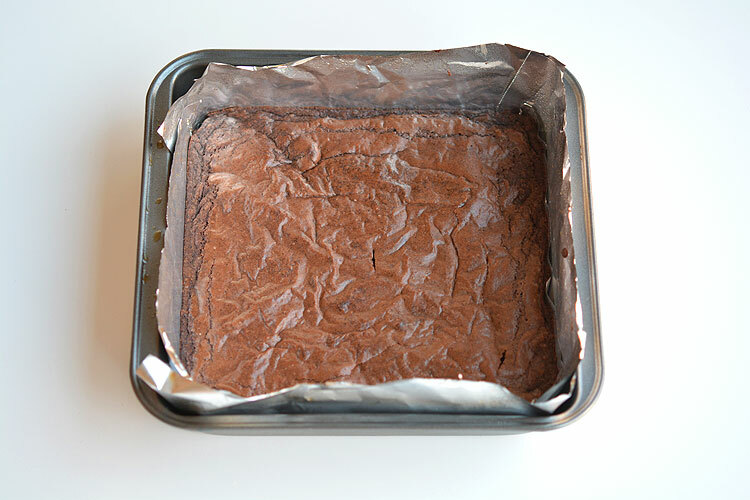 Bake the brownies according to the package directions and allow them to cool completely. I waited about an hour and a half and they came out of my pan no problem. This next part kind of blew my mind a little bit. 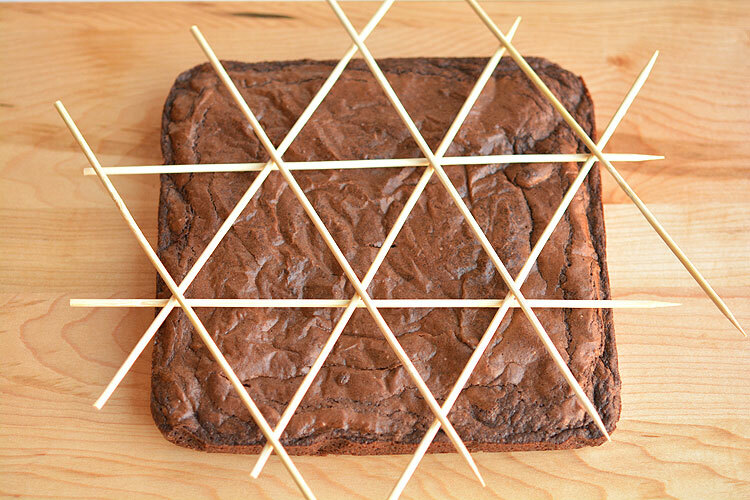 I was having trouble visualizing the triangles, so I used skewers to get them all set up. There wasn’t really a good way to mark where to cut, so I guessed as best I could. The skewers were just a diagram to help me visualize it. I took them off before I cut it. 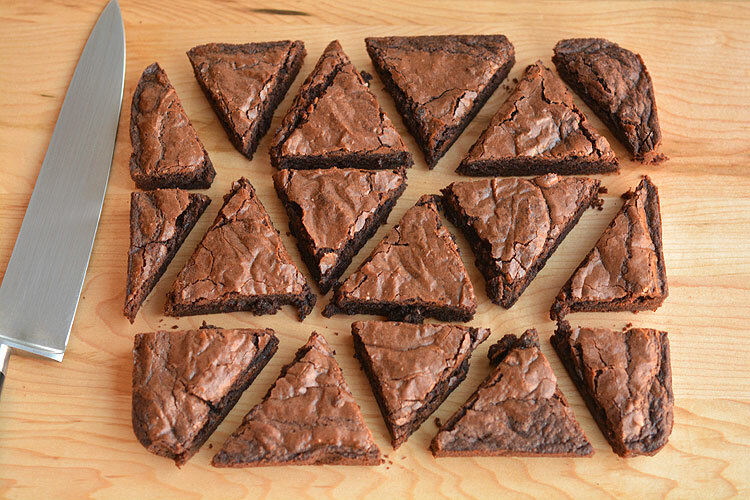 Use a large sharp knife to cut through the brownies. 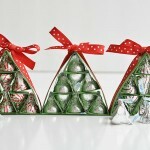 You can see in the picture below that my triangles aren’t perfect. Oops! I had to trim a few of them into the proper shape after this photo. I trimmed some of the edges into triangles too, but me and the girls just snacked on the scrap pieces that couldn’t be used. 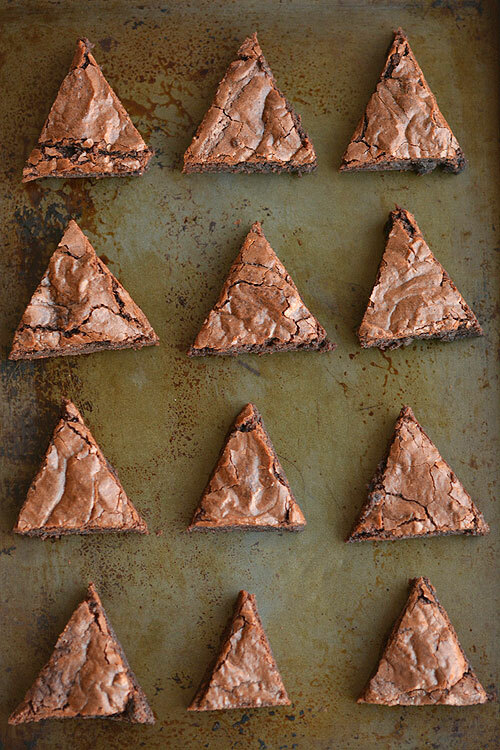 I ended up with 12 triangle brownies. 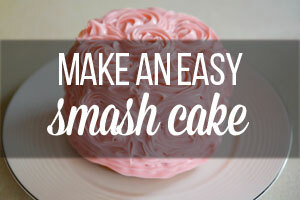 You don’t need very much icing. One half of the tub was plenty, and even then I still had leftovers. 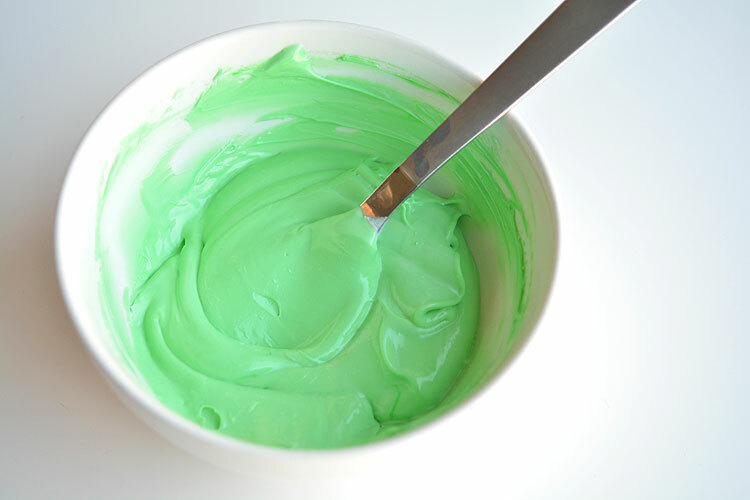 Add green food colouring to the white icing. It took a lot of green food colouring to get the green colour – at least 40 to 50 drops. Just keep stirring until you’re happy with the colour. 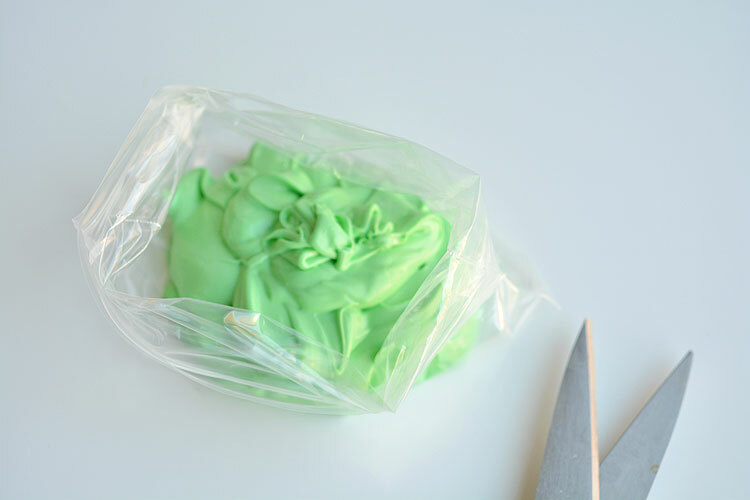 Spoon the icing into a zip lock bag. Seal the bag closed, and then cut off the corner of the bag using sharp scissors. 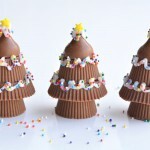 Starting at the top of the tree, gently squeeze the icing out of the bag moving in a curvy zigzag as you go down the tree. Then add your favourite sprinkles on top. I’m loving the little yellow star sprinkles! 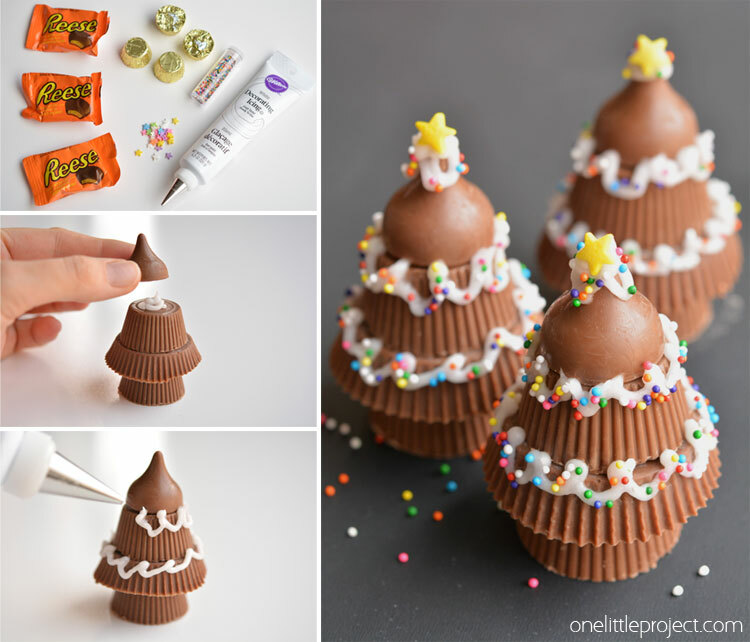 I used them in my Peanut Butter Cup Christmas Trees as well, and they really add some awesome character! I bought these from the bulk store, but you can order them from Amazon if you have trouble finding them in stores. I thought these were cute on their own, but my husband thought they needed a tree trunk. And he was totally right! 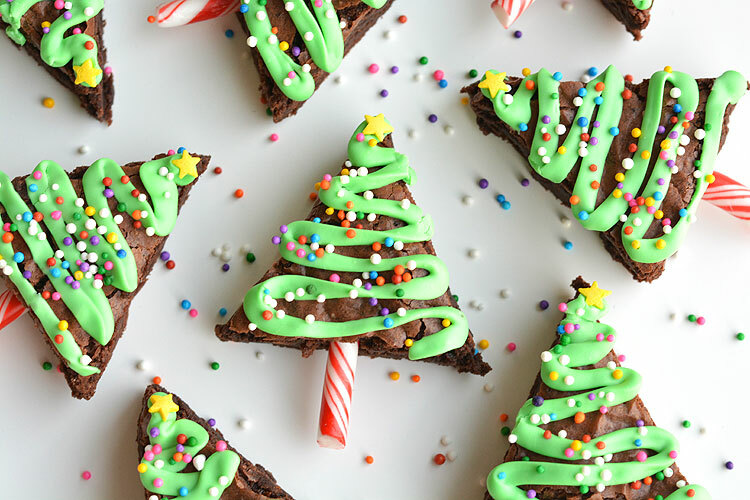 So I cut up some of the leftover candy canes from the Candy Cane Reindeer we made last week and pushed them into the bottom of the brownies, and voila! 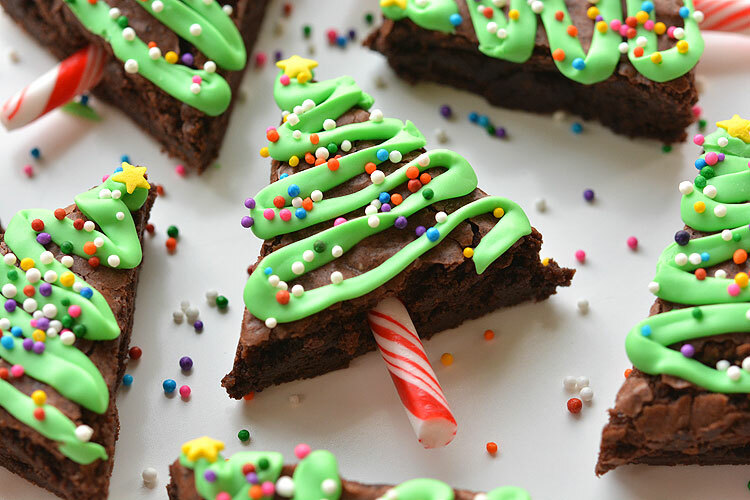 In retrospect, it would have been much smarter to add the candy cane tree trunks to the brownies before I added the icing. It was a bit difficult to maneuver them without wrecking the icing. Don’t they look awesome though!? 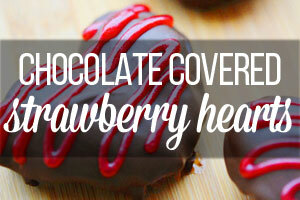 Easiest treat ever! 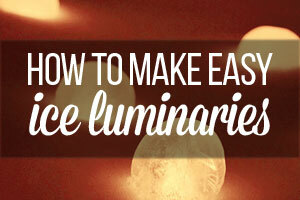 Here’s the step by step, printable recipe, just in case you need it! 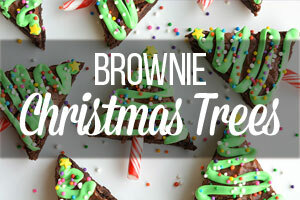 Press the sharper end of the candy cane into the bottom of the brownie triangles. 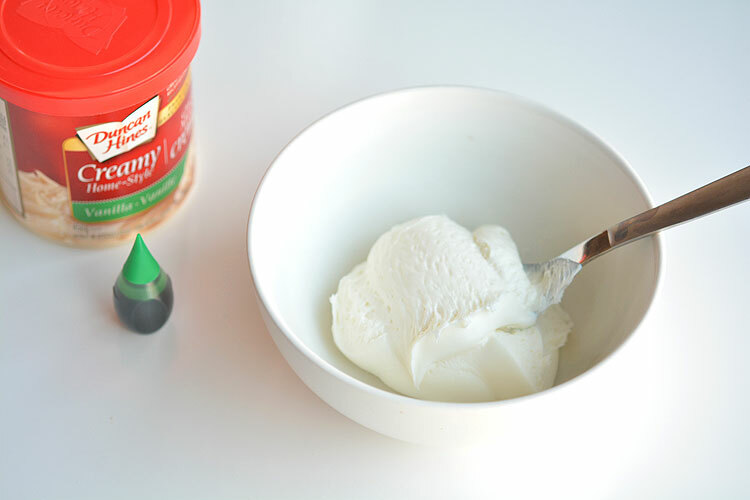 Spoon out approximately ½ of the tub of icing into a bowl. 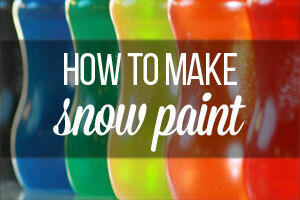 Add green food colouring until you're happy with the colour. 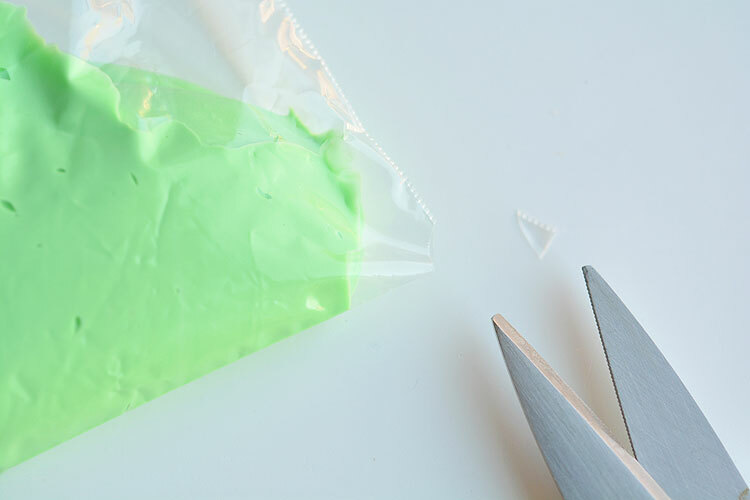 Spoon the green icing into a zip lock bag. Seal the bag and cut off a small corner of the bag with sharp scissors. 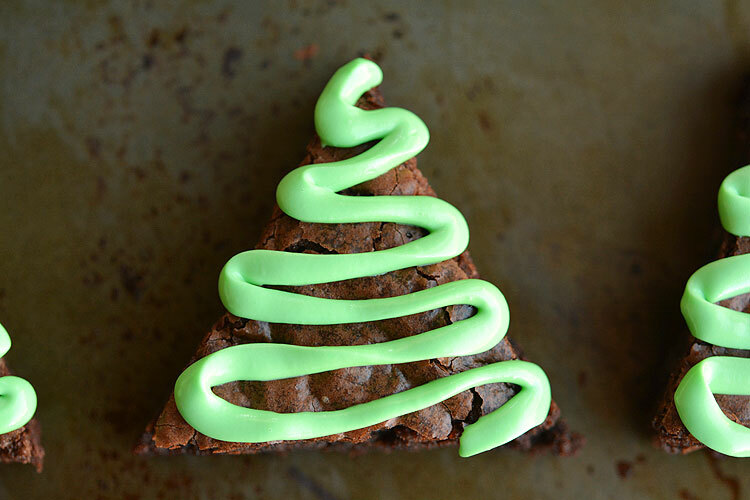 Starting at the top of the brownie triangles, gently squeeze out the icing in a curvy zigzag as you go down the tree. Add your favourite sprinkles and a small star sprinkle at the top. 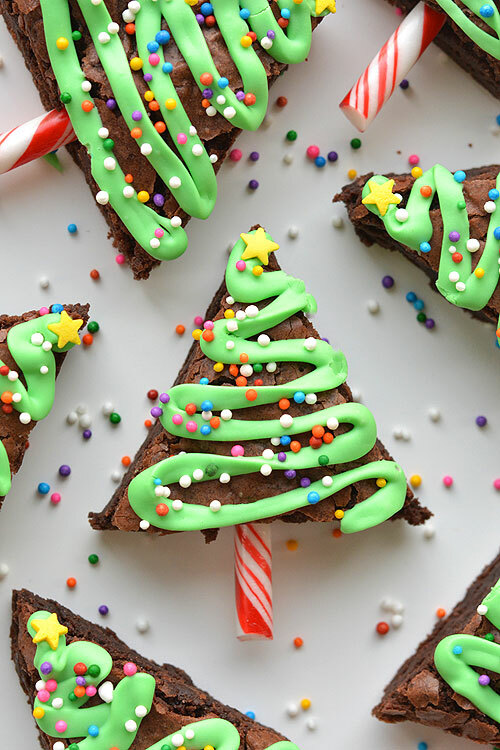 These Christmas Tree Brownies are SO EASY and don’t they look adorable?! 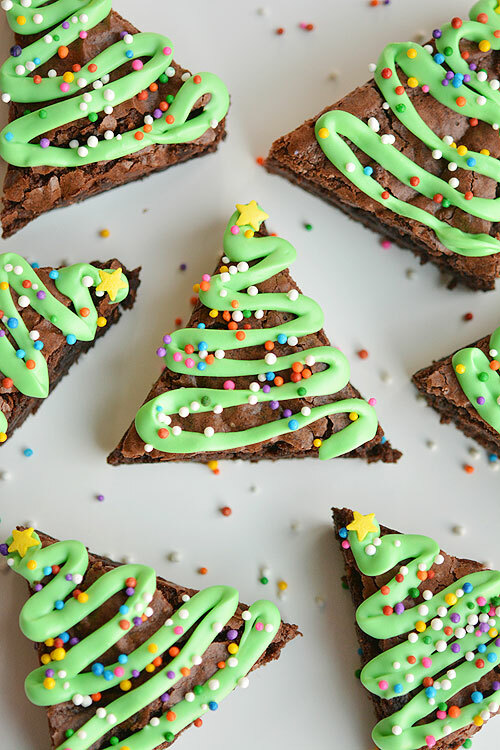 Just cut the brownies into triangles, add a candy cane trunk, squeeze on some icing, and sprinkle on your favourite toppings! 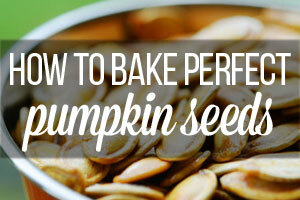 Seal them in an air tight container, and the icing will harden overnight. 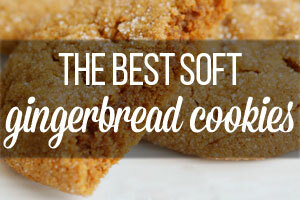 They travel well and make a great treat for a Christmas party! Oh, and did I mention, they make me SO HAPPY! my sister made these for a cookie swap we had in 2017. her recipe called for pretzel sticks for the trunk but she forgot them. 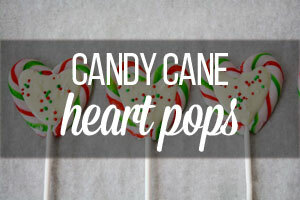 i had brought a box of mini candy canes with so i suggested that she use those. she used 3 boxes of brownie mix and put in a jelly roll pan and baked them. 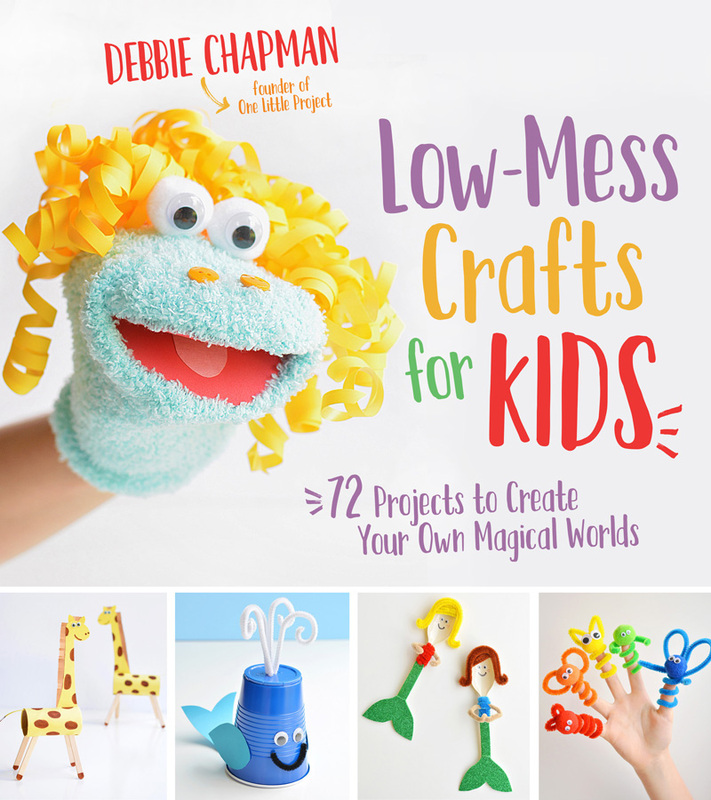 These look so cute and easy to make. 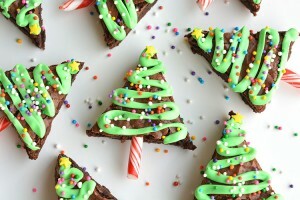 I love brownies and I like how you can easily transform them into christmas trees with this recipe. 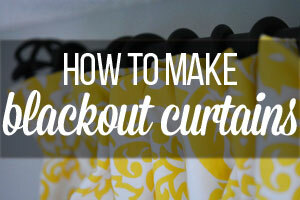 I pinned it so I can give it a try once :). Now if only I could manage to find candy canes here somewhere, or I might have to substitute those for something else. You could probably use a pretzel. 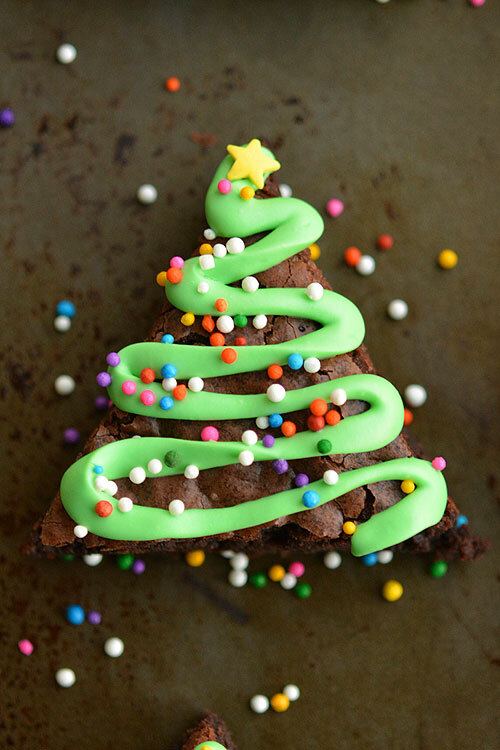 Amazing idea for Christmas brownies! 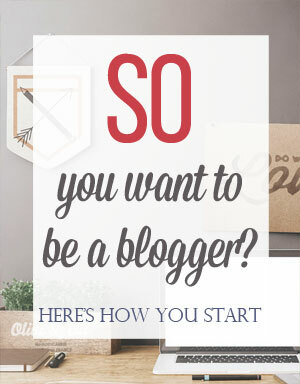 What about using a 9×13 pan? Or is the 8×8 the best for this? 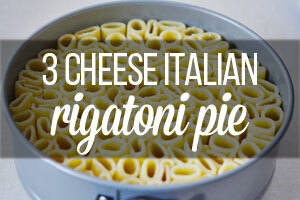 These were delicious, yummy and easy. 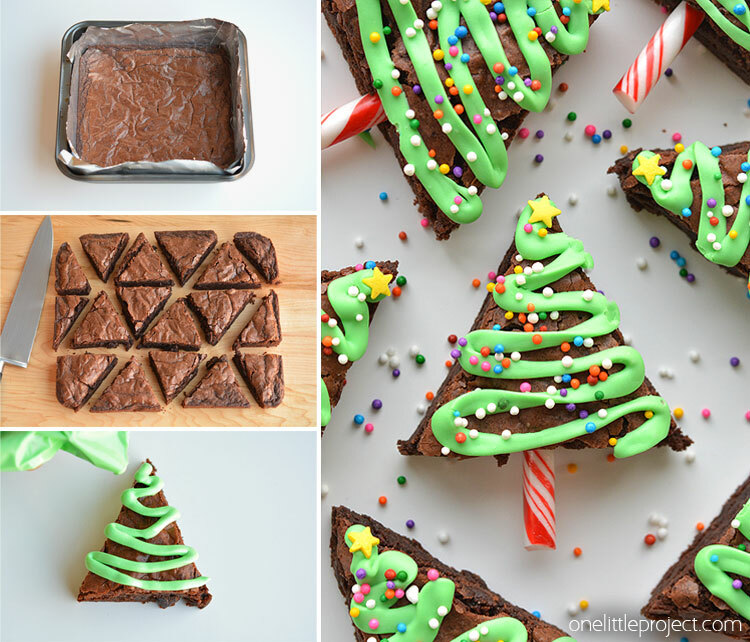 I made my brownies in a 9×13 pan so I could get more and I did not use candy canes because I don’t like them. I decorated them with gels which I can’t recommend because they don’t taste that good, but they looked super cute. Thank you! 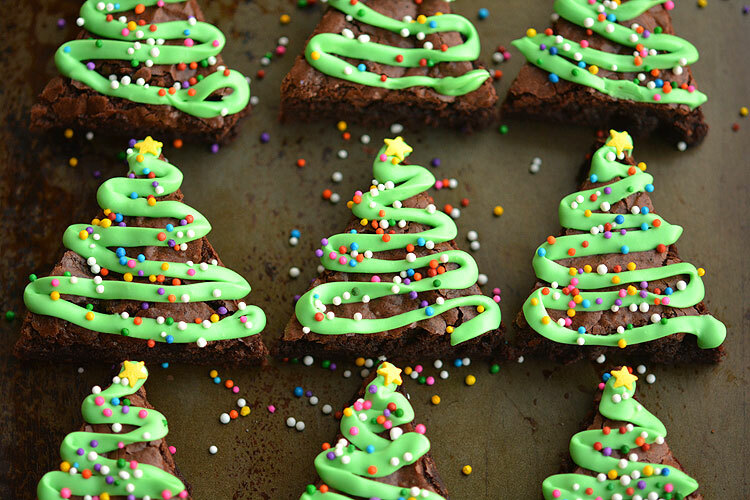 The recipe calls for boxed brownie mix and a tub of premade icing… which part was the fail???? 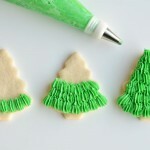 These are so cute, going to make this weekend. Gonna use pretzel stick instead of candy canes though. 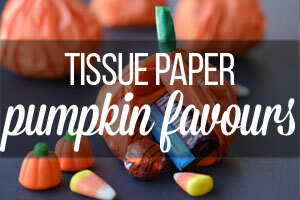 Would parchment paper work instead of foil? 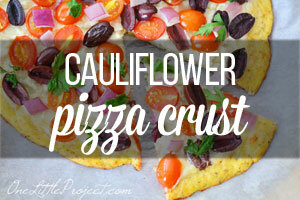 I was thinking of making these in a round cake pan and then cutting like a pizza. That would make triangles with less waste. You may have to trim the bottoms to take the curved edge off. 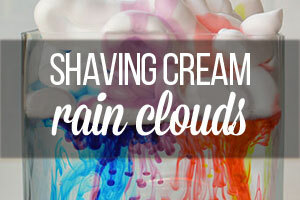 It’s such a good idea!.. The children were delighted 😉 This recipe will definitely be in my collection 🙂 Thank you!